Matt 'Trumpets' Ragsdale guides us through the tumultuous scenes that unfolded at the Brazilian GP. The sun pounded mercilessly down on the paddock as the track temperatures climbed relentlessly, not reassuring news for fans of the Silver Arrows starting on the faster but more fragile Supersofts, who have often struggled in high heat conditions with blistering and overheating, but tantalising indeed for fans of the Scuderia, who were starting on the longer lasting and more durable Soft but vulnerable at the start as they take longer to bring into the window of optimum performance. Mercedes, too, looking at sector times have loaded on downforce to help protect the rear tyres, leaving Ferrari faster in S1 and S3, but giving them quite the advantage in S2. 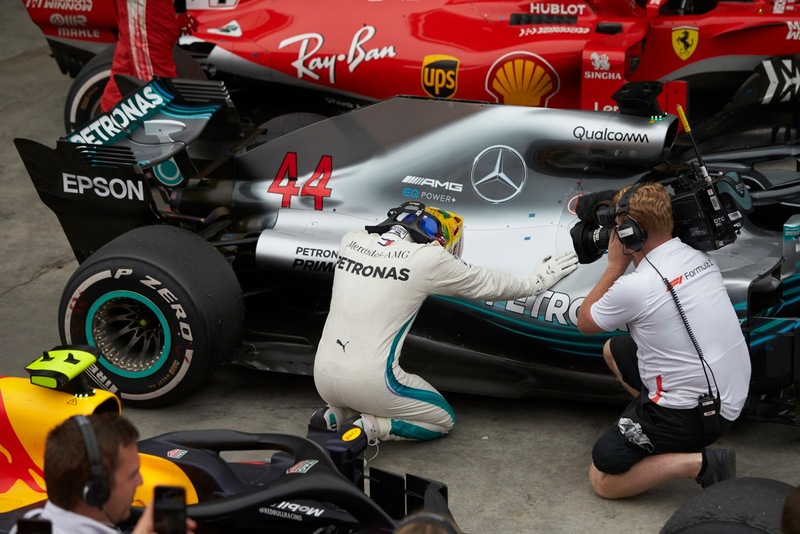 Unhappy news for fans of Hamilton as well, as there was some kind of minor oil leak on Hamilton's car, which was discovered as the car sat on the grid. Ericsson, too, had an issue, as he lost a chunk of his extractor on the way to the grid, leading to a human wall around his car as various mechanics slid underneath in an effort to sort it out and make the most of his starting position, P6. Worth mentioning neither Hamilton nor Vettel picked up grid penalties for their hijinks yesterday, Vettel ultimately exonerated because he did "eventually" (passive aggressive wording directly from the steward's report) turn off his engine and a weight was recorded for his car. He was fined for the damage he did to the scales whilst after hearing from Williams the issue of Hamilton blocking Sirotkin apparently went no further. The midfield, too, was rife with tyre strategy, with all those not making Q3 starting on Softs save Perez P12 on the Supers and Hartley P16 on the Mediums. Chance of light rain ala qualifying as the grid set off on their parade lap and made their way to the grid... oooh spicy as Vettel had an issue selecting gear as they launched for the parade lap, maximum drama!!! Lights Out!!!! Rocking start from Vettel but Hamilton covered him and then it was Bottas around the outside as Vettel locked up approaching T1. FFaikkonen back around of Verstappen who'd gotten him off the line. Ericsson down to P8 and then back to it as KMag rocked wide and was down to P11 when the dust settled. Ricciardo to P9 into the 2nd lap, wasting little time on what's a very short lap, chasing Gasly. Sainz had a move on Hulkenberg that was a bit, as they say firm, with the Spaniard getting the better of it around the final turn headed into lap 4, as Verstappen again had a go at Raikkonen into T1 and this time was successful, around the Ferrari on the outside for P4. At the front, Hamilton was hardly running away, with it, and Verstappen, taking advantage of the train, made the move again, this time into T1 up the inside and by Vettel he went as Vettel was distracted with Bottas ahead of him. Vettel then went wide into T4 with a lock up and suddenly it was Raikkonen, again the front running Ferrari. In the midfield, K-Mag had recovered from his earlier rallycross and was up to P10 as Verstappen went up the inside, and despite a move to the middle from Bottas, easily rocked by into T1 as Bottas moved back a bit to grab the racing line. On race radio, the message Bottas might be running out of battery to Verstappen was played post overtake, an interesting insight into how the battles are won and lost on track. The gap to Hamilton hung at just under 2 seconds as having been defeated by Verstappen, Bottas immediately fell into the clutches of Raikkonen. Wasting no time, Raikkonen had his first go on lap 11, with Bottas doing the dead minimum to keep Raikkonen from getting by. Verstappen knocked 0.2 seconds off on his first full lap of chasing, whilst the attack of Raikkonen was slowing Bottas even further, as the Mercedes were decidedly not the fastest of cars on track at that moment. Lap 13, 1.3 seconds between Verstappen and Hamilton. Behind, Magnussen on the Softs had carefully(ish) made his way up to P9 as Ericsson was dropping like a stone through the order, his car struggling massively with the loss of downforce due to losing a big chunk of his diffuser. At the front, the battle for P3 was slowing the rest of the frontrunners so much that Leclerc had started to appear in the background of the shots, and in fact he was just 2.3 seconds off the back of Ricciardo. Verstappen on the radio noted that Hamilton was slow, and sliding more than him, to which he was told to creep up on him. Bottas opened the door a bit for Raikkonen, but Kimi was not quite able to get the job done, and there were visible blisters on the rears of Bottas' car. Alonso had a dodgy stop in which he was stopped on his way out to reattach a loose wheel, a shame as the stop was being done to get him out ahead of Ericsson and it failed spectacularly, leaving readers to draw their own analogies. Lap 18 and Vettel was no doubt kicking himself for letting his teammate by, and Ferrari rolled out a set of Mediums to the pitlane, only to roll them immediately back. Lap 19 and Bottas was into the pits, onto the Mediums, not a happy stop as that put him out behind K-Mag into P9, so not going to protect so much against the undercut. Hamilton was in the next lap, and out again on the Medium while Verstappen was looking at a nice piece of empty racetrack to drive into. Fast lap for him then, and it turned out Mercedes had brought Lewis in before he thought his tyres were done. Stuck behind Grosjean, Hamilton was losing chunks of time as Ericsson had a spin, his day going from bad to worse in a heartbeat. Clear of Grosjean, Hamilton knocked off a purple S1 and was 0.7 seconds faster than Verstappen and 17 seconds back. Ericsson was brought in to retire, a crushing blow for the Swede who had looked set to have his best ever race till the car literally fell to pieces around him. Lap 23 and Verstappen was kept out, with a 7.8 second lead over Raikkonen. For Ferrari, obviously looking to extend their stint and slow their rivals from behind, they were setting times in the upper 1:13s as Hamilton was all over the back of Leclerc and then by, into P5 on lap 24. Of course, all that overtaking and pushing comes with a cost to the tyres, even on the hardest and more durable tyre offered for the race, which was looking at a total of 49 laps if a one stop was still the Strategy for Mercedes. A fairly large chunk of the midfield had already cycled through the pits and that traffic was beginning to affect Verstappen, who was catching them most inconveniently in S2. 3 laps later and in came Vettel and onto the Mediums, ostensibly to protect him from Ricciardo, as Bottas caught, and was severely defended, by Grosjean, costing him nearly 2 seconds on the same lap. Lap 29 and he got the job done as it came in that Vettel's stop was a staggering 1.9 seconds. Hamilton was told to match Verstappen's times and even as he was complaining about how close he was, Verstappen radioed his tyres were feeling better, and he was up to the 1:13.2's and Hamilton was just shy of 20 seconds back and according to Mercedes, just 0.7s to the good. Lap 32 and Raikkonen was in and out on on Mediums, but out behind Vettel, the undercut having been just powerful enough. 20.1 seconds now between Hamilton and Verstappen as Hamilton was approaching another chunk of lapped traffic and the Red Bull was running some sort of powerful tyre protection spells. Hulkenberg was told to retire lap 34, not helping Renault at all in their attempt to hold P4 in the WCC. Vettel had rocked up behind Bottas and was trying to put the moves on him, trailing at just 0.3 seconds as they tocketed down the straight on lap 35 but just not quite close enough to get the job done into T1. Vettel then moved aside to let Raikkonen by and have a go on fresher tyres. The virtual battle raged between Hamilton and Verstappen and as Max came upon some new traffic Red Bull called him in and it was on. Verstappen was out on the Softs, but it was a 3 seconds stop and this let Hamilton by after a white knuckle trading of laptimes over the previous 18 laps. Now it was a hunt and chase for Verstappen with grippier and fresher tyres and just a 3 second gap. With Max looming in his mirrors, Hamilton again was complaining of sliding as behind, Raikkonen was under half a second on Bottas, who was trapped behind Alonso. Into T9 Alonso finally let Bottas by, but turned in ahead of Raikkonen, slowing his lap as well, before moving aside into T11 and releasing the Ferrari back to the chase. From radio traffic it emerged Red Bull was betting on fresher tyres over track position, and as if the racing gods heard them, Hamilton was complaining of engine dropout which Mercedes was "looking into" just as Ricciardo was into the pits, on lap 39. But too little too late as on Lap 40 and down into T1 it was Verstappen and Hamilton wheel to wheel down the straight and Verstappen was into the lead, coming around the Mercedes onto the straight and just outdragging him down to T1, using the extra grip of his tyres to carry a massive dose of momentum. But Hamilton wasn't done and he chased the Red Bull down the hill, but by time they got to S2 the extra grip of the Softs saw Verstappen opening up the lead. Having played the cautious game up to this point, Ricciardo, on the back of Vettel and with a fresh set of Softs, had a rather cheeky go around the outside but Vettel neatly closed that door and then, disaster for Verstappen at the start of lap 44 as he was suddenly picked up off track, spinning his wheels and regaining the track out of the Senna esses after Hamilton flashed by. On replay, it was a collision with Ocon as Ocon, 1 lap down and in P16, tried to go round the outside into T1 with fresh tyres and unlap himself. Verstappen kept the inside through T1, then as he took the apex for T2 and the start of the esses, Ocon kept his nose in as they went into T2, his front axle and the rear of Verstappen's car suddenly trying to occupy the same space and doing fairly decent damage to both cars. Trashed floor for the Red Bull and a distinctive hobbling of his pace. Needless to say, that was an incident the stewards were going to investigate and indeed, precious little time elapsed before the notice flashed up. Lap 46 and Ricciardo finally got round Vettel into T1, Vettel kept the battle raging and Ricciardo was able to keep the place into T4 even as Vettel pulled alongside. by outbraking him into the entry, his Soft tyres more than a match for Vettel's Mediums. Even as Verstappen was all over the radio, trying to figure out how to balance out the damage to the aero, Mercedes was on with Lewis and concerns about the health of his PU were suddenly very, very real. Lap 53 and now Bottas was the concern for the Silver Arrows, as he was under severe attack by Ricciardo, as Red Bull informed him that Bottas was forbidden to use any more overtake as they rolled into the second half of the lap. Lap 54 and Vettel was back in for a set of Supers, as his race was rolling backwards and going nowhere fast. But another failed gambit from the Ferrari strategy screw up machine, as he wound up behind both Leclerc and Grosjean. This baffled Mercedes, but nonetheless they rocked out the team in case they decided to bring in Bottas and cover it off. The following lap and back in they went, with Verstappen just inside 4 seconds off Hamilton and Ricciardo inside half a second on Bottas. Mercedes asked Bottas to hold him up, and his reply was, that without the overtake button he couldn't guarantee anything. Vettel was now the fastest thing on track, but the numbers that mattered most was Verstappen, even with his damage, half a second a lap faster than Hamilton and 13 laps to get it done. Lap 58 and the stewards had their say, stop and go for Ocon, to the surprise of no one as the following lap, Ricciardo stole the position away up the inside into T1, and Bottas, unlike Ocon, backed off as the apex of T2 beckoned, sparing himself the ignominy of the Force India driver. Having been passed , Mercedes then brought Valterri in to cover off Vettel. This opened the possibility that Mercedes could actually take the WCC if they finished as they ran on lap 61. Ahead, Ricciardo was plotting to make Ferrari's job more difficult as he had set his sights on getting by Raikkonen and nabbing the final podium position with 8 laps and 2.5 seconds to go . Both Vettel and Bottas were mired in traffic that was variously impeding him and the blue flags were flying, with both McLarens under investigation for ignoring them. Despite appearing to have a little extra pace, Verstappen wasn't able to significantly close the gap and with 5 laps left, the damage appeared to be too great for Max to make up for it. But there was still some drama, as Hamilton was up and lapping a battle between Stroll and Alonso, neatly done as he split them down the straight, trailed Alonso through the esses and then rocked it by into T4 on lap 66. Ricciardo then was on the back of Raikkonen's gearbox, inside half a second with the last podium spot beckoning as the traffic at the front was now paring Hamilton's lead massively, a full second lost getting by Sirotkin and Perez, whom he was lapping for the second time. Ricciardo continued to dangle just off the back of Raikkonen but there was radio drama at Toro Rosso as Gasly was incensed that he would be asked to move aside for Hartley, who was on a different strategy than him. A slo mo replay of Hamilton's tyres showed a neat line of blisters but with 2 laps left there was nothing in it, and without traffic to aid him, the best Verstappen could do was match Hamilton's pace. Into T4 and Hartley was by Gasly, that internecine war settled and the raging battle for 3rd looked to be falling the way of Ferrari, as Raikkonen was able to use the more powerful engine to stay ahead and as the last lap ticked into the history books and Hamilton crossed the line, it was the double for Mercedes, WCC and WDC. On radio, Verstappen was apparently less happy, although it was hard to tell as aside from a hope that he and Ocon not cross paths, the entire rest of his message was bleeped out. Obviously tinfoil time, but there will be 0 escaping the speculation that Ocon, a young Mercedes driver, was operating on supersecret instructions to win Mercedes the race... so if you have proof, then by all means hit us up, but outside that, it was just Ocon trying to prove a point and getting it all wrong. Very, VERY wrong. Speaking of zombies, the battle between Grove and Woking nominally went to Woking, with Vandoorne 2 places up on Sirotkin, but honestly, it's a reach to find much to say other than thank goodness there's bit of a reset with the regs next year that might offer something for fans to hang their hats on. Renalt were blanked, and the retirement of Hulkenberg perhaps weighing a bit more heavily on Ricciardo's mind, as outside COTA and Mexico, Renault's season has been a slow downward arc the second half of the season, which could, of course, putting most of the resource toward's next year's offering.